Where Women Work s​howcases the impressive work and achievements of women​,​ while shining a spotlight on the companies supporting them. Taking place annually on 23 June, International Women In Engineering Day (INWED)celebrates the achievements of outstanding women engineers, and aims to inspire a new generation of females entering the profession. At a time when the UK needs to produce thousands more engineers, as women only make up 9% of the engineering workforce - International Women In Engineering Day helps drive interest in future jobs opportunities in the engineering sector. Top companies like AECOM, GKN, Schneider Electric, Diageo and Rio Tinto and more are celebrating this important day on 23 June and are helping to and support the achievements of the many impressive women engineers working within their organisations. These companies are also actively encouraging more girls into science, technology, engineering and mathematics (STEM) through various outreach programmes and projects. In support of International Women in Engineering Day, AECOM is hosting some great events to inspire and support girls who are interested in STEM subjects and forging a career in engineering. AECOM’s Buildings and Places CEO, Peter Flint, will be on a panel at the impressive #9percentisnotenough conference in Birmingham on 23 June.The event is held by the Institute of Engineering and Technology (IET) and is aimed at those whose role it is to recruit, retain and develop women in STEM. AECOM is also involved in organising and sponsoring a series of exciting events being hosted by the ICE and IMechE. These events include a live webinar that will involve a debate to reach out to school children across the country, chaired by Roma Agrawal from AECOM’s London Structures team. There will also be a fascinating “Museum Lates” at the London Transport Museum in Covent Garden. 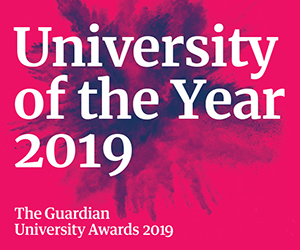 This event will see stalls at the museum by a number of universities and companies as they showcase impressive work by their female engineers, and there’ll also be a number of keynote addresses impressive speakers. AECOM’s Nayera Aslam describes how she was inspired to become an engineer by her father helping her to believe that being female should never restrict her ambition. Since joining AECOM, Nayera has pushed boundaries and forged her engineering ambitions. Natani Gourneau, a facilitator of Operation Dam Excellence at AECOM feels that it's imperative to have more women on construction sites and in the industry due to their specialised skills. “Every chance I get, I encourage the younger generation of women to do what challenges them and ensure that they understand there are no boundaries to what they can do to make it happen!" she says. As a civil engineer, Sue has managed numerous infrastructure improvement projects during her 31 year career, and her extensive experience has proved beneficial in her work as Aviation Director at Heathrow, one of the world’s busiest international airports. We’ll be also be hearing about the different career journeys from women at this leading global engineering firm, AECOM, and we’ll soon be featuring this experience in some upcoming insightful pieces published here soon. GKN is well aware that the engineering sector faces particular challenges in recruiting and developing women to achieve their full potential, and they’re very committed to promoting gender parity. In an engaging video that will soon to be launched to celebrate INWED - we’ll meet GKN employees from across the world discussing the importance of their roles, what brought them to GKN in the first pace, and why they feel valued working for this top employer for women. Karin Feuerbaum, Finance IS/IT Director Shafts & Services at GKN Driveline is aware there is a gradual shift in gender representation in engineering, but that there is much work to be done. “Male attitudes towards women are changing for the better but women still have a way to go before we achieve true equality. We have to support women to change this, motivate them to develop their career and show by example that this is an interesting area to work in,” she says. Read what further impressive women working at GKN have to say about their thriving careers. Working to create connected technologies that reshape industries, transform cities and enrich lives - the work by women at Schneider Electric is truly impressive. Understanding the importance of a diverse workforce, Schneider Electric has many initiatives supporting the advancement of women's careers through to executive level including diversity days, maternity leave policy, network activities, women leaders events, gender workshops for leaders, a women in leadership programme and more. Nicola’s career has thrived at Schneider Electric, a clear demonstration that when organisations reward and nurture top talent, great things can happen! Nicola offers some excellent advice for women in STEM looking to launch a career in engineering. “My three top tips would be to be persistent, be resilient and to be yourself. Don’t feel you have to change to fit into a preconceived world of engineering, there’s room to be yourself,” she says. Claire Dowsett’s career has seen her work on a variety of exciting and innovative projects in the fast growing Energy Sector. Claire explains why she chose Schneider Electric, and how this diverse company has helped her grow into the successful professional she is today. Highly commended for its focus on diversity and inclusion, Schneider Electric is paving the way for a new generation of engineers. 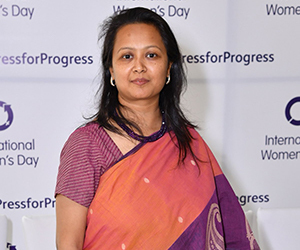 Hear Tanuja Randery, Schneider Electric’s CEO of UK & Ireland, discuss why it’s important to have influential women working in the UK engineering sector, and read about their current initiatives underway. To celebrate INWED, global drinks company Diageo is inviting aspirational female students who hold an interest in STEM careers to an inspiring event that will be held in conjunction with Moray Skills Pathway. With a tour of a Scottish Diageo distillery, a bio energy plant and a maturation plant, students will be given deep insight into the engineering roles available within Diageo and their drinks supply division based in Scotland. Diageo is working hard to broaden women and girls’ understanding about the wide variety of jobs available within their industry and local communities. By encouraging more female students to recognise the exciting range of careers and pathways available to them, they hope to help increase the number of women working in engineering. Over 120,000 people work in the engineering industry in Scotland (and just 22% of those are women), so there’s still a long way to go until we reach gender parity in the sector. Rio Tinto is a global leader in the mining and metals sector with over 60,000 people operating across six continents in more than 40 countries. From their operations to their work with communities, everything they do is with the future firmly in mind. They're committed to sustainable and innovative ways to do business, deliver results and build a great work environment. They invest in women over the long term. They do this by fostering diversity, offering challenging and exciting work and development opportunities, rewarding good performance, and providing quality leadership at every level. And exploration and discovery have certainly been at the heart of their business for over 140 years. “Women support each other in more ways than we’re aware. It’s as simple as a presence, a smile, and a 5 minute check-in with other women that creates a supportive environment that we can all thrive in,” says Emma Biggs who works as a Superintendent in Rio Tinto’s Production Planning. 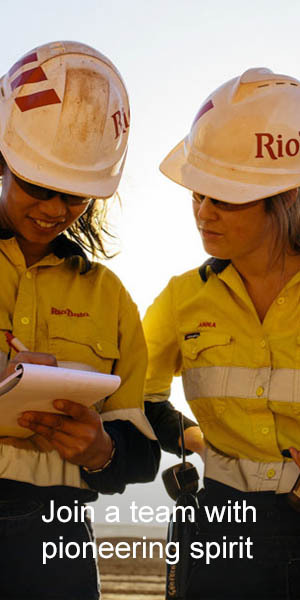 Here Hannah a mechatronics engineer at Rio Tinto discusses the importance of studying maths and science and where it can take you in your career. Anne Wittmeyer is a Research Scientist, at Rio Tinto Alcan's Arvida Research and Development Centre in Quebec's Saguenay Lac-Saint-Jean region. She did a PhD in chemistry in France at Université de Strasbourg and post-doctoral studies at Université de Sherbrooke. Anne appreciates the fresh vision and dynamics that interns bring to her research team at Rio Tinto. “I love how broad my work is. It brings different people together and builds links between education and the business. It enables me to make an impact for the future of the company, the Traditional Owners and the region,” says Rio Tinto Archaeologist, Eloise Hoffman. So there’s clearly still a great deal of work to be done in educating and inspiring young women to fully understand what the engineering sector can offer them as a vocation. With exceptional global companies actively supporting women to enjoy tremendous thriving careers, there has never been a better time to consider engineering as a profession.